I started off this week with Alex's new purchase, Article 27. It was a game I've seen before and, in fact, had bought for my sister as a present, buy never played myself. It's got some auction-ish mechanics and some negotiation but to me it felt like year 7 maths homework. Not entirely unpleasant, but like more of an equation to solve than a game. I would describe it as fine. A fine game. Dan won, so gets a gold star and a smiley face. Although it does actually come with an actual wooden gabble. So that's fun. 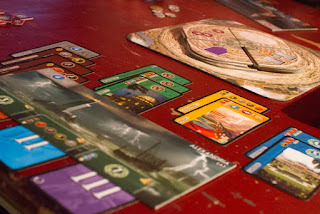 My second game of the night was 7 Wonders with the Babel expansion. An expansion that not only adds a communal board that affects all players, but also a whole host of symbols that no one fully understands. In some ways it makes the game more chaotic because you can't plan for what's going to happen in the future. That was Mike's complaint anyway. But in some ways it makes it less chaotic because you know how you can effect the game and so you can plan for that. I personally like to think of it as not better or worse, just different. Isn't that how all expansions should be? I came pretty much last. Afterwards we played it again, this time without the expansion. I came first. Maybe Mike is onto something after all. On the table across from me there was more newness. The Kickstarter titan (it got over 8 million dollars of funding) Exploding Kittens. I didn't play it or even see it myself but I did hear it described in various ways ranging from "alright" to "pretty poor". I also heard Justine won. And although not a new game by any means, but new to IpBoG, Mike brought Armorica along. As always a bunch of other games were played; Beasty Bar, One Night Ultimate Werewolf, Shadow Hunters, Biblios and Spyfall.